A new experience on www.innova9.io! 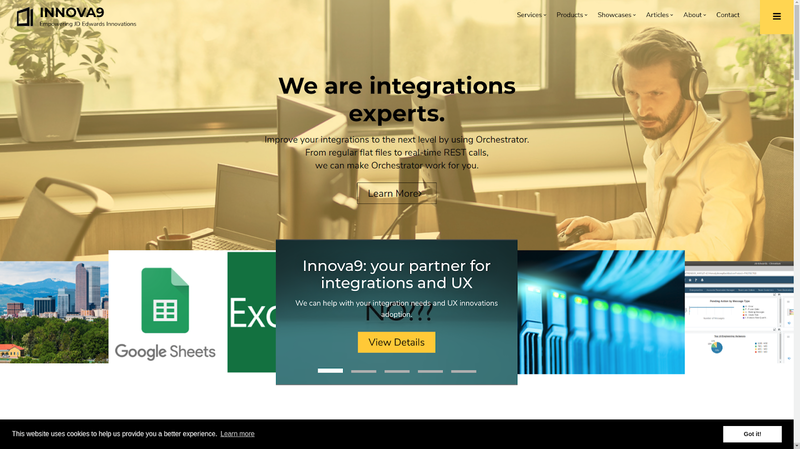 After almost a year, a new and redesigned web site for Innova9. With this new website, we'll be able to communicate better, educate better, and we launch a new initiative for integrations: We'are now Dell Boomi's Partner and we can build seamless integrations for on-prem, Cloud and hybrid business scenarios using JD Edwards' Orchestrator and the versatility of Dell Boomi. Also, we're launching our Products section, starting small with our JD Edwards' Sandbox installation and hosting as well as our Orchestrator Masterclass. There's more to come! Take a look at our Services: all focused on EnterpriseOne innovations, from UX One Enablement, to our new Online Help Desk, where we'll serve your Business Analysts, Power Users, and End Users with instant messages to help with UX and User Defined Objects activities. All in a super affordable price, available per user / per month on subscription base. Want more? Our articles now have a new place! Started with the JD Edwards' history, now we'll create new articles for a fun reading and to share more about not only the technicalities of EnterpriseOne, but the human side as well. We hope you enjoy our new website! the blog is nice.im really enjoyed the above information.the information is mainly based on studying.Thanks for this.